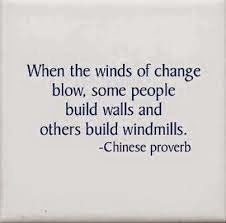 Winds of Change - Something New Everyday! The winds of March are blowing. Seemingly blowing out all the old from Winter’s darkness to open up a new dawn of enlightenment. Winter is letting go is a metaphor for each person to do some Spring cleaning of what ways and thoughts have accumulated to dampen down fresh, new thinking and behavior. Are you in the Winter of your mind where you’re in a state of freeze for change? Times change but it’s your choice to change with them, or busy yourself with treading water, and going nowhere as the world of the new is upon us like never before. Animals are incapable of consciously making the changes that we as humans can choose to make, but for our freedom of choice to cling to the past out of fear and ignorance. People who are afraid of getting into fearful situations arrange a life of no change, a routine that becomes a dead routine. Life is in a state of flux. Do you remain stagnant from something new getting in the way? The same place, photographs, same furniture, same habits, everything the same? The groove of little change is a comfort zone of avoiding life and love. Become an astronaut of your inner being, and face the fears of change. Why live in a way that is almost in a grave, convenient and comfortable which is nearly like a subtle grave. Face your blocks of complacency and fears little by little. Soon you will start enjoying the changes you will make. Change will give you vitality...more aliveness, zest, energy. Then you will not be like a pond...closed from everywhere, not moving. You will become like a river flowing towards the unknown, and towards the ocean where the river becomes lost. Do not be dualistic. Truly be one with your life as the subtle mind of nirvana. This is what subtle means. Something is subtle not because it is hidden, nor because it is elusive, but because it is right here. We don’t see it precisely because it is right in front of us. In fact, we are living it. When we live it we don't think about it. The minute we think about it, we are functioning in the dualistic state and don’t see what our life is. The space between change and status quo is reachable, but by not paying attention it is light years away. Relax and just stop everything to enjoy moments of stillness everyday. Today too many are trying to multitask with ten things where the mind is tired out and the heart sits waiting for attention. Don’t be stuck on what amounts to the lies about yourself. Roll with the winds of change, and be with them to deeper blessings into the joys of life!